465 Beaufort Street, Highgate WA 6003 is a commercial retail listing for lease by Nigel Samuels from P.A. Samuels (1966) Pty Ltd. This property was listed for lease with a listing price of $125,000 Annually and has been described by the agent as 377 SQM High Profile Beaufort Street Retail Opportunity. 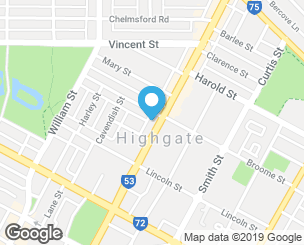 If you're interested in getting in touch with Nigel Samuels regarding 465 Beaufort Street, Highgate or other retail for lease in Highgate please call 0419 988 807 or contact the agent via email. With a population of just under 2,000 people, Highgate is an inner-city suburb just two kilometres from Perth which boasts a charming mix of art deco influenced real estate and vibrant urban entertaining sectors. Home to many restaurants, Highgate is a popular destination for dining with plenty of social establishments within the suburb. At the heart of Highgate is Beaufort Street. Loved for its array of distinct dining experiences, pubs, wine bars, shops and cafes, Beaufort Street is an urban playground for locals and visitors alike. The Flying Scotsman and Queens Tavern are two old school pubs that never fail to draw a crowd, while the Astor Theatre is a terrific venue for many acts that come through Perth. Sacred Heart Primary School and Highgate Primary School are the suburbs local schools.